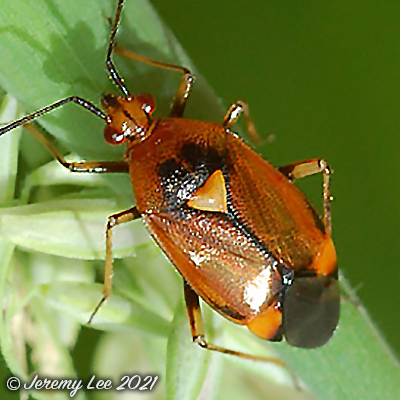 Deraeocoris ruber, more commonly known as a Mirid Bug, is a species of bugs in the Miridae family that can be found anywhere in the UK. The nymph of the species is black coloured with pinkish back. The ground colour (inlcuding the scutellum) ranges from red-orange to almost fully black, although the cuneus is always red to some extent. The forewings are very shiny. The tibiae are unbanded and the 1st antennal segment and at least the base of the 2nd are black. They feed on small insects and can be found on a range of plants, including nettles. Adults are 6-8mm in length and can be seen July to September.